cycling of nutrients, sequestration of carbon, production and consumption of trace gases, and degradation of water, air, and soil pollutants (Groffman and Bohlen, 1999). What are the consequences of biodiversity? Does the massive array of hundreds of thousands of fungi and probably millions of bacterial species make sense in any ecological or evolutionary context? As was noted in Chapter 3 on microbes, the numbers of bacterial species are greatly underestimated because most investigations have relied on cul-turing isolates and examining them microscopically. There have been two key developments in studies of microbial diversity. First, the use of signature DNA sequences has greatly increased the numbers of identified taxa, with hundreds of novel DNA sequences being identified yearly. Two bacterial divisions, which appear to be abundant and ubiquitous in soils but have very few cultured representatives, are Acidobacterium and Verrucomicrobium (Hugenholtz et al., 1998). Second, we have only recently come to an appreciation of the incredibly wide distribution of prokaryotes (both Archaea—methanogens, extreme halophiles living in hypersaline environments, and hyperthermophiles living in volcanic hot springs and mid-sea oceanic hot-water vents—and Bacteria) worldwide. Prokaryotes constitute two of the three principal domains, or collections of all organisms, with Eucarya consisting of protists, fungi, plants, and animals (Fig. 7.1) (Pace, 1999; Coleman, 2001). The total numbers of bacteria on earth in all habitats is truly mind-boggling: 4-6 • 1030 cells, or 350-550 petagrams (1015g) of carbon (Whitman et al., 1998). The amount of the total bacteria calculated to exist in soils is approximately 2.6 • 1029 cells, or about 5% of the total on earth. Amajor-ity of bacteria exist in oceanic and terrestrial subsurfaces, especially in the deep mantle regions, extending several kilometers below the earth's surface. Some of these organisms, which are the most substrate-starved on earth, may have turnover times of centuries to millennia (Whitman et al., 1998). FIGURE 7.1. The universal tree of life. The three domains of life—Bacteria, Archaea, and Eucarya—are shown here represented by small-subunit rRNA sequences of various organisms within each domain. 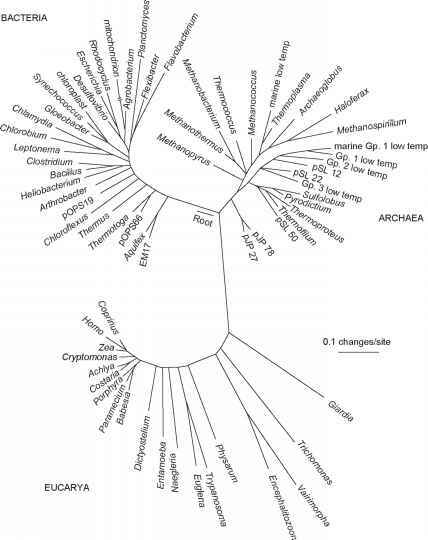 The domain Bacteria (Eubacteria) and the domain Archaea (previously the archaebacteria) are entirely microbial, and the domain of Eucarya is predominantly microbial (from Pace, 1999). What is the implication of the apparent "excess" of species diversity of soil microflora, where many species exist at a very low frequency and in an inactive state? If considerable species richness and accompanying large genetic pools are maintained in soils, what are the impacts on the evolution of new taxa? 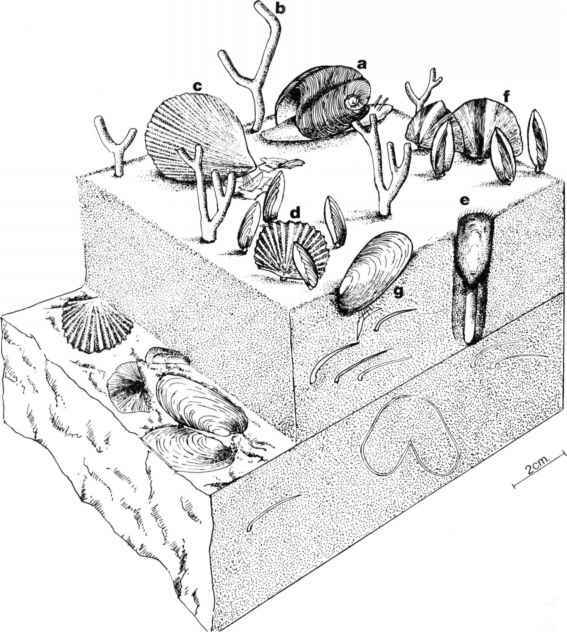 What are the implications for ecosystem function if this degree of redundancy exists; does it imply that some of the organisms are somehow vestigial remnants or relics of bygone conditions (Coleman et al., 1994b)? What are the functional roles of such hidden or apparently cryptic organisms? Are they performing some essential but unknown functions, perhaps at microsites that we don't observe or work with? One approach that may show promise is the use of reporter genes linked to gene promoters; this technique is used to measure in situ the activity of specific enzymes related to defined processes (Wilson et al., 1994). We need to link specific methods such as those noted here with soil thin-section studies, such as those of Tippkoetter et al. (1986), Postma and Altemueller (1990), and Foster (1994). Such means will enable the inclusion of spatial dimensions to soil ecological studies; addition of a temporal one provides the much-needed aspect of time as well. Soils are rife with historical signs and legacies, as has been made evident by studies using radiotracers, and stable isotope studies (Stout et al., 1981; Nadelhoffer et al., 1985; Gaudinski et al., 2000). What are the linkages between biodiversity and ecosystem function? It should be possible to look for natural "experiments" such as regions with low species richness, e.g., on an island, versus sites at similar latitudes that are on continents, where one can measure key ecosystem processes such as rates of decomposition or nutrient cycling. Under such conditions, all of the major abiotic factors are held reasonably similar, allowing study of the impacts of species richness of key indicator microflora or fauna on ecosystem processes of interest. Such experiments are certainly performable, and might yield some surprising results. Studies of the interactions of climate change and biological diversity have been reviewed by Vitousek (1994) and, in a modeling context, by Smith et al. (1998). By using species-area curves from island biogeogra-phy it is possible to estimate the fraction of species whose loss is entrained by loss of habitat (land use change), even without knowing how many species exist (Wilson, 1992, cited in Vitousek, 1994). Unfortunately, there is little information available on soil organisms to conduct such a comparative study. More than 20 studies of the empirical evidence of relationships between ecosystem processes and different components of plant diversity (species richness, functional richness, and functional composition) were followed in natural and synthetically assembled groups of grassland species worldwide (Diaz and Cabido, 2001). The linkage was found to be neither simple nor universal, but some significant trends were noted. The range and more particularly the values of functional traits carried by plants (e.g., whether they are nitrogen-fixing, warm-season grasses or rosette forbs) are generally strong drivers of ecosystem processes. These studies combined simplified microcosms and natural field sites, so extrapolation from them is limited (Table 7.2). However, it is noteworthy that most of the studies showed that species richness and functional composition had positive effects on above-ground biomass. Numbers of species aboveground and belowground may be correlated when taxa in both habitats respond similarly to the same or correlated environmental driving variables, in particular across large gradients of disturbance, climate, soil conditions, or geographic area. Differentiating between simple correlation and causation may be problematic, however. High diversity in plant species can result in high diversity of litter quality or types of litter entering the belowground system. This resource heterogeneity can lead to a greater diversity of decomposers and detriti-vores (Hooper et al., 2000). In contrast, a high diversity of resources and species in soil could feed back to a high diversity aboveground, where certain species or functional groups are closely linked to groups belowground. A useful example of this was noted by van der Heijden et al. (1998), who found a positive correlation between the diversity of endomycorrhizal species and plant diversity, perhaps because different species of fungi infect different species of plants to different degrees, although alternative explanations have been offered for these patterns (Wardle et al., 1999). Interestingly, Hartnett and Wilson (1999) and Smith et al. (1999), working in a Kansas tallgrass prairie, showed that mycorrhiza promoted obligately mycorrhizal C4 grasses, resulting in competitive exclusion of facultatively mycorrhizal C3 species, reducing overall plant species diversity. A similar mechanism seems to operate in tropical rainforests, in which ectomycorrhizal (ECM) tree species competitively exclude arbuscular mycorrhizal (AM) species (Connell and Lowman, 1989, cited in Wardle, 2002). It should be noted that at the level of functional types of mycorrhiza, this pattern does not hold: low-diversity AM can be associated with high diversity of plants, and high-diversity ECM communities can be associated with low diversity of plants (Allen et al., 1995). In an extensive experiment carried out under field conditions, Porazinska et al. (2003) tested aboveground-belowground diversity relationships in a naturally developed tallgrass prairie ecosystem by comparing soil biota and soil processes occurring in homogeneous and heterogeneous plant combinations of C3 and C4 photosynthetic pathways. Some bacterial and nematode groups were affected by plant characteristics specific to a given plant species, but no uniform patterns emerged. Interestingly, invasive and native plants were quite similar with respect to the measured soil variables (e.g., phospholipid fatty acids, protozoa, and nematode functional groups). Contrast these results with those of Belnap and Evans (2001) given toward the end of Chapter 8. TABLE 7.2. Empirical Evidence of Relations between Ecosystem Processes and Different Components of Plant Diversity"